Dengue (DF) and dengue hemorrhagic fever (DHF) are caused by one of four closely related virus serotypes (DEN-1, DEN-2, DEN-3, and DEN-4). Infection with one of these serotypes provides immunity to only that serotype for life, so persons living in a dengue-endemic area can have more than one dengue infection during their lifetime. The global distribution of Dengue is comparable to that of malaria, and an estimated 2.5 billion people live in areas at risk for epidemic transmission. Each year, tens of millions of cases of DF occur and, depending on the year, up to hundreds of thousands of cases of DHF. The case-fatality rate of DHF in most countries is about 5%, but this can be reduced to less than 1% with proper treatment. Most fatal cases are among children and young adults. The reasons for the dramatic global emergence of DF/DHF as a major public health problem are complex and not well understood. The first reported epidemics of DF occurred in 1779-1780 in Asia, Africa, and North America. The near simultaneous occurrence of outbreaks on three continents indicates that these viruses and their mosquito vector have had a worldwide distribution in the tropics for more than 200 years. Generally, there were long intervals (10-40 years) between major epidemics, mainly because the introduction of a new serotype in a susceptible population occurred only if viruses and their mosquito vector could survive the slow transport between population centers by sailing vessels. A pandemic of dengue began in Southeast Asia after World War II and has spread around the globe since then. 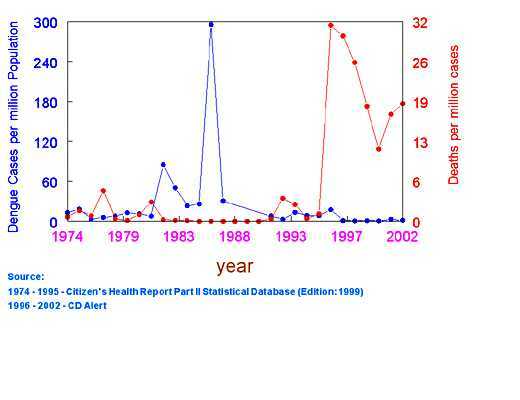 Epidemics caused by multiple serotypes (hyperendemicity) are more frequent. In the last few years since early 2000, dengue is the most important mosquito-borne viral disease affecting humans. In India DHF is the leading cause of hospitalization and death among children. Dengue virus was first isolated in India in 1945. Aedes aegypti is the principal vector of Dengue. The number of Dengue cases ranges from 7-16 thousand per anum. A maximum of 2,17,9996 cases were recorded in the year 1986. A major outbreak of Dengue has occurred since August-September 2006 in North India especially centered around the National Capital Region of Delhi. DF and DHF are primarily diseases of tropical and sub tropical areas, and the four different dengue serotypes are maintained in a cycle that involves humans and the Aedes mosquito. However, Aedes aegypti, a domestic, day-biting mosquito that prefers to feed on humans, is the most common Aedes species. Infections produce a spectrum of clinical illness ranging from a nonspecific viral syndrome to severe and fatal hemorrhagic disease. Important risk factors for DHF include the strain of the infecting virus, as well as the age, and especially the prior dengue infection history of the patient. Dengue virus is a positive, single-stranded enveloped RNA virus of the genus Flavivirus. The total genome of dengue virus is approximately 11 kb in length. The genome is composed of three structural protein genes, encoding the nucleocapsid or core protein (C), a membrane associated protein (M), an envelope protein (E), and seven nonstructural (NS) protein genes. Dengue virus complex consists of four serologically related but antigenically and genetically distinct viruses (DEN-1, -2, - 3, and -4). Infection induces a lifelong protective immunity to the homologous serotype but confers only partial and transient protection against the other three serotypes. It is generally accepted that secondary infection with various dengue virus serotypes is a major risk factor for DHF and DSS due to antibody-dependent enhancement. Other risk factors related to DHF-DSS include the virulence of the infecting virus, the age, immune status, and genetic predisposition of the patient. The diagnosis of Dengue is typically made in most cases on clinical grounds. However, infection with dengue virus produces a wide spectrum of clinical features ranging from asymptomatic or non-specific viral syndrome of typical dengue fever (DF), to a severe and fatal dengue hemorrhagic fever/dengue shock syndrome (DHF/DSS). Studies from Eastern UP have also shown that Dengue can be an important cause of liver failure. Studies have shown that more than 50% of infected individuals are either asymptomatic or have an influenza-like undifferentiated fever. Thus diagnosis of dengue virus infection on the basis of clinical syndromes is not reliable, and the diagnosis should be confirmed by laboratory tests. Therefore, there is a need for rapid detection and typing of dengue viruses. In the laboratory, dengue virus infections are diagnosed by the isolation of the virus, direct detection of viral antigen, the detection of specific antibodies and presence of viral RNA. Virus isolation by cell culture followed by fluorescent-antibody staining. Serological diagnosis of antibodies based on capture immunoglobulin M (IgM) and IgG enzyme-linked immunosorbent assays (ELISA). Generally, virus isolation is time consuming and takes about 7-10 days, while serological diagnosis can be confusing because of the antibodies that cross-react with other flaviviruses. Also the antibody test can be negative in early stages of infection (first 5-7 days) or in some cases of reinfection. In contrast, identification of dengue virus by molecular methods such as reverse transcriptase polymerase chain reaction (RT-PCR) is highly indicative of an acute infection in human serum or plasma. Further, this method can also identify different serotypes of dengue virus. In addition when used with real-time PCR technology, this assay can be quantitative and can be used to follow the course of infection in severely affected patients with suspected DHF / DSS. Atharva BioSciences introduces the first commercially available Real-Time PCR based diagnostic test for detection of Dengue viral RNA. This test detects all the 4 types of Dengue viruses and can be performed in blood or in any other body fluid. We will provide an estimate of viral load and further testing can be done to identify the individual viral type (ie Den1 or Den2 or Den3 or Den4). No dengue vaccine is available. Recently, however, attenuated candidate vaccine viruses have been developed. Efficacy trials in human volunteers have yet to be initiated. Research is also being conducted to develop second-generation recombinant vaccine viruses. Therefore, an effective dengue vaccine for public use will not be available for 5 to 10 years. Prospects for reversing the recent trend of increased epidemic activity and geographic expansion of dengue are not promising. New dengue virus strains and serotypes will likely continue to be introduced into areas where the population densities of Ae. aegypti are at high levels. With no new mosquito control technology available, in recent years public health authorities have emphasized disease prevention and mosquito control through community efforts to reduce larval breeding sources. Although this approach will probably be effective in the long run, it is unlikely to impact disease transmission in the near future. We must, therefore, have improved, proactive, laboratory-based diagnostic systems that can provide early warning of an impending dengue epidemic and confirm the diagnoses in suspected cases. Atharva is proud to introduce such tests which would be especially useful in making the diagnoses and following the course of infection in endemic areas. A. Dengue (pronounced den' gee) is a disease caused by any one of four closely related viruses (DEN-1, DEN-2, DEN-3, or DEN-4). The viruses are transmitted to humans by the bite of an infected mosquito. The Aedes aegypti mosquito is the most important transmitter or vector of dengue viruses, although a 2001 outbreak in Hawaii was transmitted by Aedes albopictus. It is estimated that there are over 100 million cases of dengue worldwide each year. A. The principal symptoms of dengue are high fever, severe headache, backache, joint pains, nausea and vomiting, eye pain, and rash. Generally, younger children have a milder illness than older children and adults. Dengue hemorrhagic fever is characterized by a fever that lasts from 2 to 7 days, with general signs and symptoms that could occur with many other illnesses (e.g., nausea, vomiting, abdominal pain, and headache). This stage is followed by hemorrhagic manifestations, tendency to bruise easily or other types of skin hemorrhages, bleeding nose or gums, and possibly internal bleeding. The smallest blood vessels (capillaries) become excessively permeable ("leaky"), allowing the fluid component to escape from the blood vessels. This may lead to failure of the circulatory system and shock, followed by death, if circulatory failure is not corrected. A. There is no vaccine for preventing dengue. The best preventive measure for residents living in areas infested with Aedes aegypti is to eliminate the places where the mosquito lays her eggs, primarily artificial containers that hold water. Items that collect rainwater or are used to store water (for example, plastic containers, empty drums, buckets, or used automobile tires) should be covered or properly discarded. Pet and animal watering containers and vases with fresh flowers should be emptied and scoured at least once a week. This will eliminate the mosquito eggs and larvae and reduce the number of mosquitoes present in these areas. A. The emphasis for dengue prevention is on sustainable, community-based, integrated mosquito control. Preventing epidemic disease requires a coordinated community effort to increase awareness about dengue/DHF, how to recognize it, and how to control the mosquito that transmits it. Q. How can we diagnose Dengue reliably? A. The diagnosis of Dengue is typically made in most cases on clinical grounds. However, this method is unreliable. The other methods of either virus isolation or serological diagnosis can also have inherent problems because virus isolation is time consuming and the antibody test can be negative in early stages of infection (first 5-7 days) or in some cases of reinfection when it is likely to be most severe. Atharva BioSciences introduces the most reliable way of diagnosing Dengue. Our state of the art molecular laboratories perform the very specific and sensitive Real-Time PCR based diagnostic test for detection of Dengue viral RNA. This test detects all the 4 types of Dengue viruses and can be performed blood. Blood needs to be collected in EDTA vials (lavender top tube) and sent immediately to our laboratories in cold or frozen state. We will provide an estimate of viral load within a day of receiving the sample. Further testing can be done to identify the individual viral type (ie Den1 or Den2 or Den3 or Den4). Callahan, J.D.,Wu, S.J., Dion-Schulrz, A., et al, Development and evaluation of serotype and groupspecific fluorogenic reverse transcriptase PCR (TaqMan) assay for dengue virus. J. Clin. Microbiol. 39, 4119-4124, 2001. Lam, S.K., et al Detection of specific IgM in dengue infections. Southe. Asian J. Trop Med. Public Health 18 (4), 532- 538. 1987. World Health Organization, Dengue Hemorrhagic Fever: Diagnosis, Treatment, Prevention and Control, 2nd ed. World Health Organization, Geneva, Switzerland. 1997. Baruah J, et al, Incidence of dengue in a tertiary care centre--Kasturba Hospital, Manipal. Indian J Pathol Microbiol. 2006 Jul;49(3):462-3. Khilnani P, et al, Epidemiology and peculiarities of pediatric multiple organ dysfunction syndrome in New Delhi, India. Intensive Care Med. 2006 Nov;32(11):1856-62. Epub 2006 Sep 15. Paramasivan R, et al. Serological and entomological investigations of an outbreak of dengue fever in certain rural areas of Kanyakumari district, Tamil Nadu. Indian J Med Res. 2006 May;123(5):697-701. Dash PK, et al. Reemergence of dengue virus type-3 (subtype-III) in India: implications for increased incidence of DHF & DSS. Virol J. 2006 Jul 6;3:55.